Our fear of snakes seems almost primal. Indeed, along with fear of falling and fear of the dark, it’s, more or less, a universal fear. This makes sense when you consider that our early ancestors were likely targeted as prey by slithery monsters and had to watch their step in the tall grass and lush jungles of the Palaeolithic past. Today, it’s still prudent to treat snakes with caution. Although North America has nowhere near the number of venomous reptiles found elsewhere, those we do have warrant respect. We need to know what potentially dangerous species look like, how to avoid them, and how to keep them away from our chickens and our children. For all snakes though—even the dangerous ones—some appreciation is called for. They are worthy allies in the war against insects and rodents that carry disease or dig holes in our fields and gardens. Some species of snakes can be amazingly beautiful. And most are harmless. There are 151 species of snakes in North America and of these, 20 species are venomous. Snakes can be found everywhere: parched deserts, humid swamplands, prairie grasslands, and the cold heartland of the northern states and Canada. They are most often found in rural or wilderness areas. They are common on many farms. The following are some harmless and some venomous snakes you may have on your place, tips on how to snake-proof your henhouse, and finally what to do if you meet a snake. Found from Mexico to Alaska, by far the most frequently encountered snake in North America and perhaps the world (almost 90% of all snakes here are garter snakes). These guys rarely reach four feet long. Harmless, beneficial, and cute to boot. 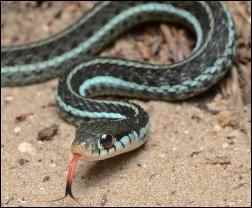 Pretty little snakes with blue, green, yellow, or white stripes along the length of their bodies. One of the few snakes that bear live young instead of eggs. They don’t constrict or envenom their prey, but either kill or stun it with their bite and eat them alive (oh, don’t grimace—they are snakes after all). Aptly named, these critters consider brown rats haute cuisine. Constrictors, they’re beneficial when predating mice, rats, moles, and other rodents, but not so much when downing your eggs or even your small birds (they’re also called Chicken Snakes because of their penchant for chicken eggs). If you have Rat Snakes in your area, count your blessings but take measures to keep them out of your henhouse. They range from forest, floodplains, swamps, and fields throughout the south-eastern and central United States and up into southern Quebec and Ontario in Canada. Their average length is six feet but some can reach up to ten feet long. Depending on the species they come in every color of the rainbow, including red, yellow, grey, green, and indigo. Commonly found in barns and suburban areas, they’re also good tree climbers. Although they are nowhere near rare, their numbers are declining due to tree-cutting and land development. These shy snakes react to threat by freezing. The Texas and Black Rat Snakes are more aggressive and may snap at you if you harass them. Although these snakes are non-venomous, their bites can be painful. Farmers have long welcomed Rat Snakes in barns and outbuildings. Old-timers would move snakes found near the henhouse and relocate them to the fields or woodlands instead of killing them. Later in this article, I’ll give you some tips for protecting your chickens. A subspecies of Rat Snake, Corn Snakes are so named because of its habit of snaking through corn cribs in search of mice and rats. Beneficial? You betcha. 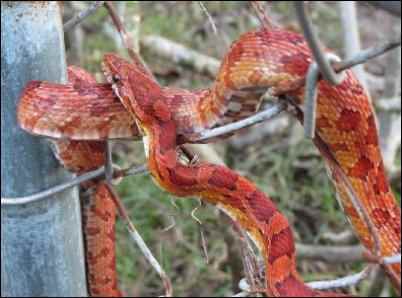 Unfortunately, their coloring is similar to the venomous Copperhead and many are killed because of it. But Corn Snakes are one of the most docile snakes and the most popular reptile pets in the world. Shy, secretive, they like to hide under brush, logs, and rocks when not actively hunting. These are slender snakes, averaging three to six feet long. They live in fallow fields, meadows, and farm outbuildings. They’re good climbers, following rodents from bedding stalls into haylofts. You’ll find these snakes throughout the eastern U.S. and as far west as Texas. There are several sub-species of Gopher Snake that include Bull and Pine Snakes and they deserve a special mention as they are a boon to farmers. These are some of the larger snakes in North America, averaging five to six feet long. 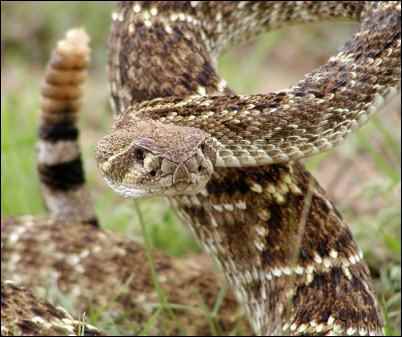 Famed as rattlesnake imposters, they are nonetheless described as harmless. Unfortunately, if you find them downing your prized quail chicks you may tend to disagree. These snakes mimic rattlesnakes with similar coloring and behaviour when threatened. They puff their bodies up to look as large as they can and coil like a rattler. They have no rattles but they’ll shake their tail and if in leaf litter create a rustling sound. 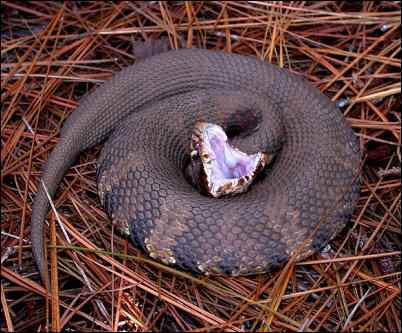 Pine and Bull Snakes will force air through their throats making a rattling sound. 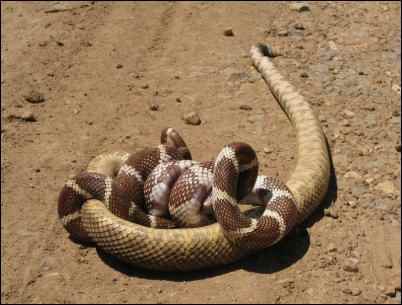 Gopher Snakes may strike out with their noses, trying to poke or push you away. Not to say they won’t bite, but it is very rare. Any injury should be minor and not very painful. If bitten, clean and swab the wound with antiseptic. There are a couple of ways you can tell these snakes from rattlers: they hiss, rattlers do not; they are sleeker than rattlers and have beautiful round eyes and pupils, where rattlers have elongated eyes with elliptical pupils like a cat’s. Bull Snakes most resemble rattlesnakes. 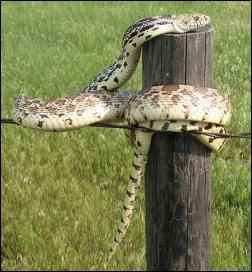 This is advantageous against predators that avoid venomous snakes, but does little to endear them to humans. Bull and Gopher snakes can be found from Western Canada to Northern Mexico, although Bull Snakes prefer the more arid regions of the west. Gopher Snakes can also be found in Wisconsin, Illinois, Missouri, Oklahoma, and western Texas and prefer woodland and its edges, marshlands, and cultivated fields. Pine Snakes live in deciduous and pine woodlands, prairies, fields, and brush land in the American southeast. This guy eats snakes, including venomous ones. They’ll also eat rodents, lizards, birds, and eggs. The Scarlet Kingsnake and its cousin the Milksnake have yellow, black, and red stripes. They’re often confused with the venomous coral snake and suffer the consequences. Milksnakes earned their name from frequenting barns looking for mice and gained a reputation for suckling cows! This is, however, completely false. These beautiful snakes prefer slugs, insects, crickets, and earthworms, but their entrée of choice is mice, and plenty of them. They may grow fond of your chicken eggs, too, so be prepared. All Kingsnakes are constrictors that range from three to six feet long. This family of snakes can be found from south-eastern Canada and throughout the United States in a wide range of habitats, from your kitchen to fields and forests, near rivers and rocky outcrops. Even these snakes can benefit the homesteader or rancher. Imagine a landscape filled with thousands of gophers, digging thousands of holes, eating everything from your forage to the roots of your roses. Imagine thousands of rabbits doing the same. That’s what many areas would look like without snakes, even the venomous ones. That said, these snakes can be dangerous and if you live in their territory you need to know about them. Small, slender snakes with beautiful red, yellow, and black bands. You can distinguish the Coral snake from the non-venomous Milksnake by remembering the rhyme “Red touches yellow, kills a fellow; red touches black, friend to Jack”. Corals eat other snakes and small rodents. Shy and reclusive, they don’t normally live near populated areas and would rather slip away than engage you in a fight. However, if bitten you need medical help as soon as possible as their venom is the most potent in North America. Despite this, Big Pharm stopped making coral snake anti-venom—not enough people were being bitten to make it profitable. There is still some anti-venom available though. 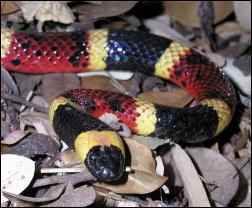 Check with the hospital in your area if you live in Coral Snake habitat to see if they have it. Distinguishable from other snakes by their oblong (not round) eyes, narrower neck area and larger triangular head. They all use venom to efficiently dispatch rodents, but you might not want them in the cowshed. Also known as the Water Moccasin these snakes are strong swimmers and you’ll often find them near lakes, streams, and marshes in the south-eastern U.S. Thick bodied, they average four feet long. Their bite is painful and often fatal. They have a habit of standing their ground when threatened and display their rather formidable open mouth and fangs. Although most will give you a wide berth, there are rare reports of territorial males being aggressive to people. Their diet varies, although they rely heavily on fish. They eat small alligators, toads, birds, snails, bird eggs, and rodents. Short, stocky, and known for their buff colored hourglass pattern, 90% of their diet is small rodents. 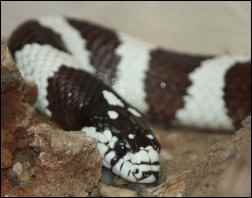 Responsible for most venomous bites in the U.S., their bite, although extremely unpleasant, is rarely fatal. Despite that, you need to get to hospital if bitten for a regimen of pain management and antibiotics. Most at home in woodlands, this snake can also be found in swamps and rocky outcrops. They’ll freeze if they see danger coming, relying on excellent camouflage to conceal themselves, which often means people don’t see them until they’re almost on top of them. 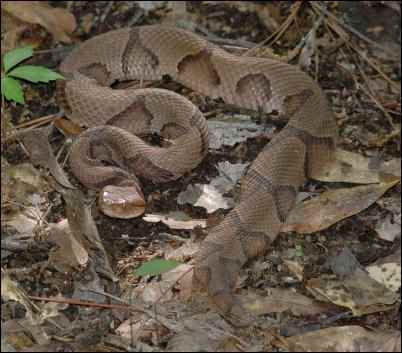 The Copperhead typically ranges from Massachusetts to Nebraska, to Texas and the south-east United States. Most are shorter than five feet long. Heavy bodied and with the wedge-shaped head typical of vipers, and with the familiar rattle at the end of its tail. Found from southern Canada to Argentina, its prey includes rabbits, ground and tree squirrels, chipmunks, prairie dogs, gophers, rats, and mice. Although rattlesnake bites are the leading cause of snake injury in the United States, you are far more likely to die of a dog attack than by snakebite. Despite this, rattlesnakes evoke fear bordering on panic in many people. Although bites caused by accidental encounters do happen, most occur because of human interference. Snakes being attacked or injured become terrified and will strike back. Interestingly, in more populated areas, rattlesnakes are evolving without their hallmark rattles. It seems evolution is selecting against identifying the snake as a rattler as that brings down a heap of trouble from humans. Snakes can be the farmer’s friend, but they can raid your chicken house for eggs and chicks, or rabbit hutches for kits, if you don’t protect them. Plan to predator-proof the coop or hutch before you build it. Raise it off the ground or put it on a concrete floor or a mat of hardware cloth. Build it of sturdy materials. 1/4” or 1/2” hardware cloth screwed in place over any opening to your coop and run should keep out any snake that can do harm. Dig a trench and bury the cloth a couple of inches at the base to deter snakes; bury it a foot to deter snakes and everything else. A line of electric wire on perimeter boards laid on the ground will keep snakes out. Keep the run and coop as clean as possible to deter rodents. Most often that’s what the snake is after. Use treadle feeders to contain feed. If you feed scraps, clean out leftovers at the end of the day. Clear the area around the coop from brush, tall grass, and debris that might provide cover for a snake. Moth balls are said to be a good deterrent if you’re willing to live with nerve toxin near your animals. Many people use cinnamon, clove, or cedar oil, and turpentine repellents. Sometimes they work, sometimes they don’t. Guardian chickens (yes, they’ll attack and even eat snakes). If you have a brave soul that will take on a snake cherish him or her. If the snake is too big to intimidate they’ll at least sound the alarm. Build brooder boxes inside snake-proof coops or wrap them in hardware wire. Remember a snake can get through any opening the diameter of its head. Caulk or seal any gaps. My mother once found a Milksnake in her garden, recognized it as harmless and picked it up to take a look. Unfortunately the snake bit her on the hand between the thumb and forefinger. More startled than hurt (the bite was trifling), it taught her and us kids a lesson. Even the most benign snakes need to be treated with respect. On the other hand a friend with a cottage in Tobermory, an area known for its usually shy Massasauga rattlesnakes, once found herself inches away from one coiled up in full, furious rattle. She’d pulled a deck chair out from a table and startled the snake that’d been hiding there. She froze. After a few heart pounding moments the snake saw sense and slithered quickly away. So how do you avoid an encounter and what do you do if that doesn’t work? Snakes are a vital part of the web of life. They have their niche in nature and should be valued for it. With a clear understanding of their behaviour and some common-sense planning, we can partner with them in our war against disease carrying vermin. Learn as much as you can about the snakes in your area and develop strategies in advance on how to deal with an encounter. Teach these to your children. Keep your homestead clear of debris and tall grass. Store wood off the ground by eighteen inches. Be careful when working with brush or wood piles. Wear gloves, boots and long sleeves and pants if you know there are snakes around. Keep snakes out of the house by caulking and sealing openings in foundations and around pipes. Use a flashlight when walking outside at dusk or at night; this is when many snakes are active. If you meet a snake, remain calm. I know this can be easier said than done, but the worst thing you can do is begin flailing and screaming. If you think you’re Rambo, attack the snake. It’s the best way to get bitten. If possible back away calmly, especially if you’ve accidently cornered a snake. Leave it alone and the snake will retreat. Chances are it’s more scared by the encounter than you are. If the snake is trapped somewhere on your property or in your house, don’t be a hero. If you don’t know the species of snake in your bathroom call in the experts to remove it. If you’re more experienced, you can place an open box on the floor and gently guide the snake into it with a stick or pole. Never prod the snake. Place the tip of the pole on the ground where you don’t want the snake to go and corral it into the box. Take it to the woods and let it go. As children we caught small striped garter snakes in the tall grass by a nearby river. They were fun to catch and a hoot as they slithered out between our fingers. We never hurt them, although the game was probably more fun for us than it was for them. They were tiny snakes with mouths too small to get a grip and we were never bitten (I can’t even remember one trying). Even now I enjoy the sight of these pretty little snakes in the brush or streaking across a pathway. Not everything has to be functional to benefit the homesteader. An appreciation of nature’s balance, of the beauty of the land, and the creatures on it, is something close to the heart of most of us seeking a simpler, sustainable, more natural lifestyle. Snakes are NOT poisonous, they can be venomous. If this article is supposed to be educational, it should be totally truthful. Man needs to quit trying to pave the world. Do we really need all the space we take? Thank you for your comment, Nature Lover. We’ve made the edit you suggested.